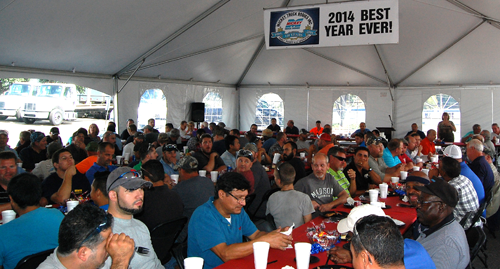 Mickey employees enjoy lunch as they celebrate 110 years in business and a banner 2014. 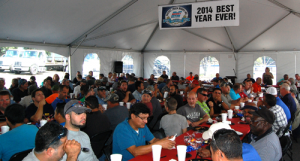 On Thursday, October 2, 2014, Mickey Truck Bodies’ employees came together at their High Point, NC headquarters for a special dual celebration marking the company’s 110th year in business and it’s “Best Year Ever,” which was its stated team goal for 2014. Executive team honors employees with standing ovation. 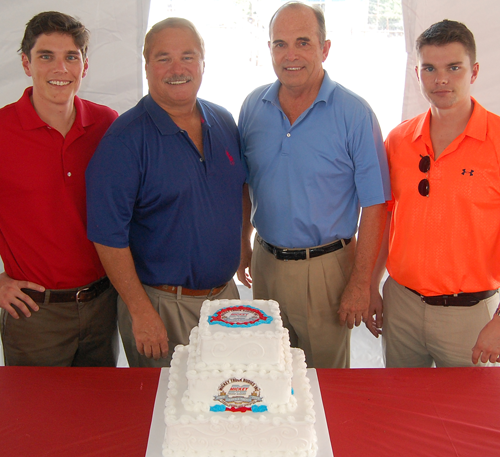 From left: Jim Hiatt, Greg Fisher, Alex Sink, Matt Sink, Dean Sink, Gail Wells, Carl Mickey, Jr.
Matt Sink, Carl Mickey, Jr., Dean and Alex Sink (from left) with a giant Mickey birthday cake.